My guilt-free Strawberry Rhubarb Nice Cream is not only quick & easy to make but also vegan, sugar-free, gluten-free and low in calories! A healthy ice cream with rhubarb, strawberries, and bananas that tastes just like summer in a bowl! All you need is a blender! Essentially, nice cream is a healthy, banana-based alternative to regular ice cream. It is not only delicious and super easy and quick to make but also really good for us! Nice cream has no sugar, no gluten, no preservatives or artificial aromas, is low in calories and hey, it’s also vegan. Bananas also happen to be pretty good for you – and who doesn’t want to contribute to one’s five-a-day with a bowl of ice cream? Using frozen bananas as a base does not only make sense from a health point of view, it also ensures that signature ice cream creaminess and makes nice cream the perfect bikini-friendly ice cream treat. Strawberry Rhubarb Nice Cream is the perfect summer dessert! Rhubarb season is still in full swing here in Alberta and I wanted to incorporate some of those pretty pink stalks from our garden into our nice cream recipe! I went with the classic combo of strawberry + rhubarb, which is one of our favourites! A couple of strawberries also add some more colour and sweetness to our nice cream! 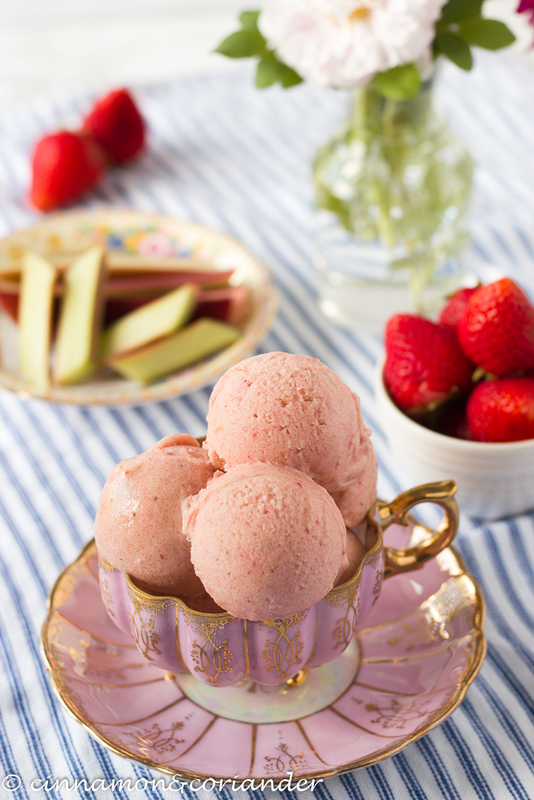 This strawberry rhubarb ice cream tastes just like summer in a bowl! Do I need an ice cream maker to make strawberry rhubarb nice cream? No, you do not! You can use either a food processor or a highspeed blender for making your nice cream. Of course, if you have an ice-cream maker standing around, then, by all means, follow the recipe and add your blended strawberry rhubarb nice cream mix to the machine to churn. The ice cream maker will whip a bit of extra air into it and will make it even lighter! Which ingredients do I need for making strawberry rhubarb nice cream? some vanilla and lemon juice are optional but recommended! Choose the right bananas for your nice cream! We want to add as little sweetener to our nice cream as possible, so make sure to use ripe, lightly spotty bananas that are ideally at the stage just before they turn overripe. At this level of ripeness, they give a better overall taste to nice creams, and they are also a lot easier for your body to digest. Do I need to serve my strawberry rhubarb nice cream right away? Can I store it? There are two ways with nice cream. If you are impatient, you can whip it up in a couple of minutes and eat your strawberry rhubarb nice cream straight out of the blender. This would be the soft-serve version. The alternative is prepared in the same manner as the soft-serve version but then given a final blast in the freezer to firm up. This version is easier to scoop and more akin to traditional ice cream. What you see in the pictures is strawberry rhubarb nice cream that has been in the freezer for about 2 hours. This seems to be the sweet spot for effortless scooping and flawless presentation. As our healthy strawberry rhubarb nice cream tastes so amazing, it is easy to forget that it actually isn’t ice cream and needs to be treated a little differently. All vegan ice creams tend to require a bit more thawing than store-bought ice creams, which are laden with sugar and fat to get that melt-in-your-mouth texture. As we do not add any of those things, nor any other softeners and artificial emulsifiers to our nice cream, it needs to sit out of the freezer for about 7-10 minutes before serving. This will give your strawberry rhubarb nice cream the change to become all creamy and scoopable. I cannot wait to try more nice cream recipes! The possibilities are endless! Just look at this coconut one or this one for peanut butter lovers! Make sure to try my strawberry rhubarb nice cream as long as the season allows it and feel free to tag your results on Instagram with my hashtag #cinnamonandcoriander! 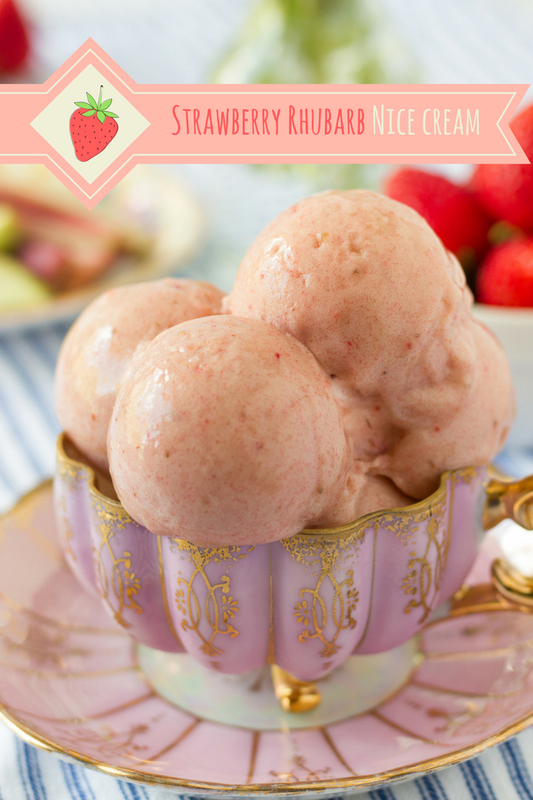 My Strawberry Rhubarb Nice Cream is a healthy, vegan & sugar-free ice cream treat for hot summer days! It is so quick and easy to make and does not require an ice cream maker! Peel bananas and cut them into slices. Wash strawberries and cut into quarters. Put the sliced fruit into freezer bags and freeze for at least 6 hours or overnight. Wash rhubarb and cut into slices. Add rhubarb to a small saucepan together with the lemon juice and a pinch of salt, and cook it for about 15 minutes until the rhubarb is completely broken down. Stir in 1 tbsp stevia and vanilla. Taste and adjust sweetness. The rhubarb compote should be quite sweet. Once frozen and mixed with the other ingredients, it will taste less sweet! Turn off the stove and pour the stewed rhubarb into a separate bowl. Allow it to cool to room temperature, then store it in the fridge for at least 2 h or overnight. Now add the chilled rhubarb as well as the frozen fruit to the blender and pulse to blend until you have a smooth ice cream. Add more sweetener if desired. The nice cream should have soft serve texture when it comes out of the blender. For a more scoopable texture, pour the nice cream in an airtight container and put it in the freezer for about 2 hours more. Leftovers can be stored in the freezer. Make sure to allow the nice cream to stand at room temperature for about 4 minutes before serving. Danke dir Anna! Es geht auch super schnell und schmeckt wirklich wunderbar erfrischend nach Erbeer und Rhabarber! Agreed! During the hot months, I even eat it for breakfast! Thanks so much, Dawn! Rübchen und Strohbohnen waren genug, um mich über dieses Rezept sabbern zu lassen. Es zu vegetieren macht es noch spezieller. Liebte die Idee. rubarb and strawbeery was enough to make me drool over this recipe.Making it vega makes it even more special.Loved the idea! Haha! Thanks so much, Aditi! Rhubarb and strawberries are just such a good team! Also, the German google translation of this one is hilarious! I love a banana-based niced cream and this one looks like a super fun version with the rhubarb! Thanks, Jenni! Yes, I wanted to come up with a nice summer version and rhubarb and strawberry are what definitely seasonal favorites! Wow this really does look like summer in a bowl! I love how flavorful it is without any of the guilt! The best part is you don’t need an ice cream maker for it, so wonderful! Thanks so much, Whitney! It is such an easy recipe and not having to dust off the old ice cream maker is always an advantage! Thanks for stopping by! Have a great weekend! What a fantastic post! I mean, first off – yum! Just YUM!!! 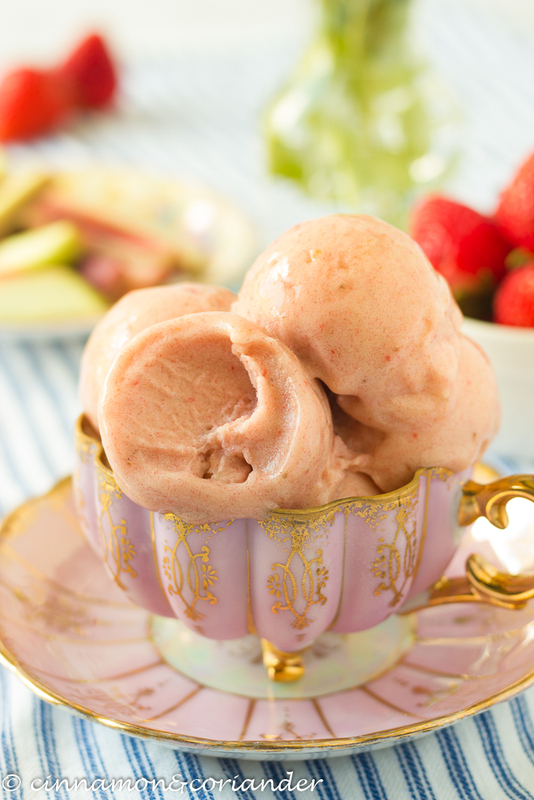 Terrific idea to spin that classic strawberry-rhubarb flavor combo into a Nice Cream! But also, you have so much helpful info here – choosing the prefect bananas, storing and thawing to get just the right texture, etc. This is so great – definitely pinning! Thanks so much, Shelley! 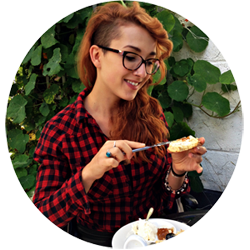 I loved writing this post and it makes me very happy to hear that you enjoyed it! Homemade ice cream is my passion and I believe that you can get great results with the right timing and the right ingredients! Thanks so much for your feedback and have a great weekend! I have to admit, I have never eaten rhubarb yet!! Yup, never tasted it. Now that I am seeing all these amazing recipes.. I definitely wanna try some soon. Hi Veena! Oh, you’ll be in for a treat! 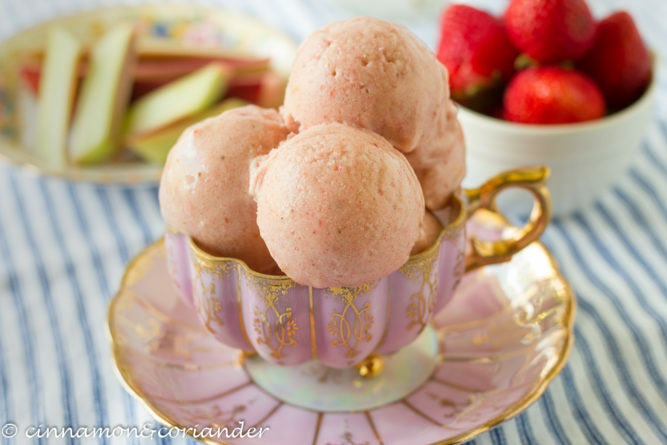 I love the tartness of rhubarb for refreshing treats like this ice cream! Wow, wow and wow! I’m loving this recipe of yours, Kiki and can’t wait to try it. My kids love icecream (duh! ), but I’m always uneasy about the amount of sugar and fat and other unhealthy things in it. Your fat and sugar free nice-cream is the perfect solution! Just one question – where can I find rhubarb? I’ve never used it in anything but would love to know more about it. Hello Saima! Thanks so much! It makes me really happy to see people enjoy my recipes! This one is perfect for the whole family to share! Concerning your rhubarb question: the availability of rhubarb depends on your location. If you’re in Europe, you still get some rhubarb at the grocery store or at the farmers market. Here in Canada, it is available at Canadian Superstore and again, the farmers market. We grow some in our garden, so this is where we most of ours comes from! The US should have rhubarb at some grocery store but I am not sure which ones! What I do know, is that Amazon started to sell frozen rhubarb and rhubarb puree! I hope this was helpful. Have a great weekend! I have never worked with Rhubarbs,but love the sound of that in almost every dish I have come across. Lovely recipe. Thanks so much, Prasanna! I am sure you would love it, should you get the chance to try it once! Oh, okay! I am in Alberta, Canada, so getting to Superstore is not a problem. I go there every week! Will look for rhubarb for sure this week. Thanks so much! 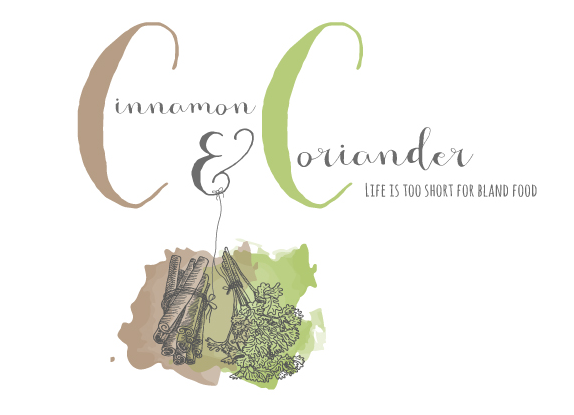 The coriander and cinnamon are a touch of genius in flavoring for this nice cream. The cup and saucer are absolutely divine and so perfect for displaying the beautiful pink desserrt! Thanks Leslie! I think your meant vanilla and lemon? And thanks – I used some cups from my mother-in-law’s china collection! I am a lucky girl! Have a great weekend! Love the color and the combo. Looks so delicious. Can’t wait to try this for my little one! Every summer I’d head to my grandmas house and we’d pick rhubarb from her garden in the backyard. This year I’m visiting for the summer and we’ve been in the kitchen baking a bunch. It’ll be nice to enjoy a healthy and refreshing summer treat together before heading back home. Hi Jessica! How lovely! I love rhubarb season and when it comes to using up the harvest the best case scenario is indeed a grandma on your side! I hope you had a lot of quality kitchen time together! Enjoy your bakes and each others company! I love making nice cream! This combination of flavors sounds delicious!